Thanks for letting me join the group! I am buying a 2015 Redwood 38RL from a good friend who just is not into campers. I am picking it up in the next couple days after he gets all his stuff out, he only has had it a month. He had many upgrades like slide toppers, LP generator, washer and dryer, and 40 LB LP tanks upgrade. I plan on attending the <Rally> in Indiana this year. How many of you will be attending the rally and if you have before how was it? Awesome! That is my favorite floor plan of the new ones! Congratulations on your Redwood purchase! We are full timers and are thoroughly enjoying our RW. We attended the National Rally last year, and hopefully will be attending this year. Next month we will be at a Regional Rally here in Texas. 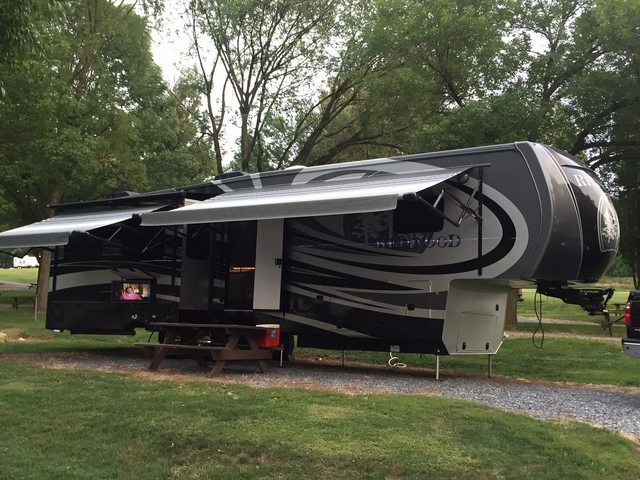 We had a great time at the National Rally...met some wonderful people who shared our love of the RV'ing, and additionally enjoyed the educational/informative seminars on using and maintaining our RW. It was well worth the effort to attend! me from attending but I am hoping to make it this year. Welcome to the Redwood family!! We're thrilled you're here! I'm a little biased, but I would recommend making it to the factory rally (if you can) to every owner! Not only is it an excellent way to meet other owners and learn more about your Redwood family, but it's a good opportunity to take The RV Professor's (Terry Cooper's) RV maintenance class. Plus you get to meet some of the major Redwood vendors (Lippert, Alpha Roof, etc) and Redwood President, GM, product designers and a ton of other people. Also, we have our team there to do repairs and some minor upgrades and changes. If the National Rally isn't doable, we'd love to see you at ANY of our Regional Ralllies too! For more info on those, see rvrallies. Let me know if you have any questions! We are in our new 38RL and If you love it half as much as us , you will be thrilled! Welcome to the group, I have learned a lot from this site. I also am planning to attend the National Rally. Again, Congratulations on your RV. Welcome to the group. We went to the rally last year had a good time and met great people.